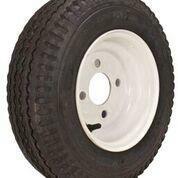 Your one-stop source for trailer tire and wheel assemblies. Americana Tire and Wheel serves major trailer manufacturers across North America. Featuring Kenda Loadstar tires and Dexstar wheels. 100's of combinations with various tire sizes and steel or aluminum wheel designs and colors available. All wheel assemblies are mounted using modern high speed equipment and carefully checked at every stage to insure you get the best quality products.